The 17-Word Solution™ can change your life brilliantly, in just three short hours. With a passing score of 70% or better, you have singled yourself out as one of those rare individuals who strive to always do what is ethical. Your Ethics Solutions® certificate is evidence that ethics is the foundation of all your personal and business relationships, because you know how to be trustworthy. You are a person who deserves quality friendships, prestige and promotions. Equally important, the knowledge you gain from the ES ethics course shows you how to identify the individuals and organizations you want in your life, and those you do not. With the ES training course helping you separate the wheat from the chaff, you will be better able to fill your life with people who are helpful instead of harmful. 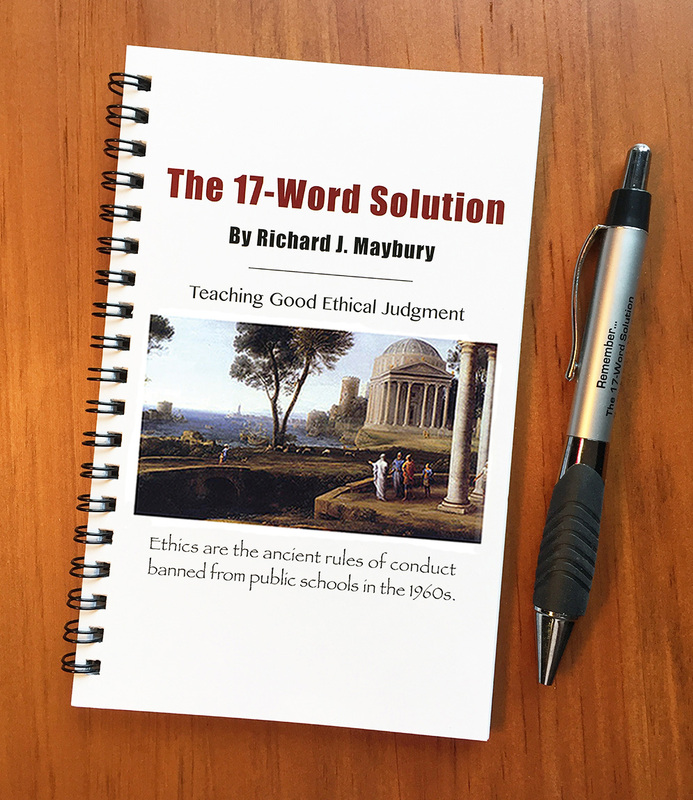 • The handbook, The 17-Word Solution, by Richard J. Maybury. We encourage you to use it as a reference, and for occasionally refreshing your knowledge of the principles that can help you stand out from the crowd. • By passing the certification assessment with a proficiency score of 70% or better, you receive the right for three years to use the ES logo and our "Certified by…" statements for your business cards, marketing, public relations, and resumes. After three years, you can purchase the course again to renew your certification. 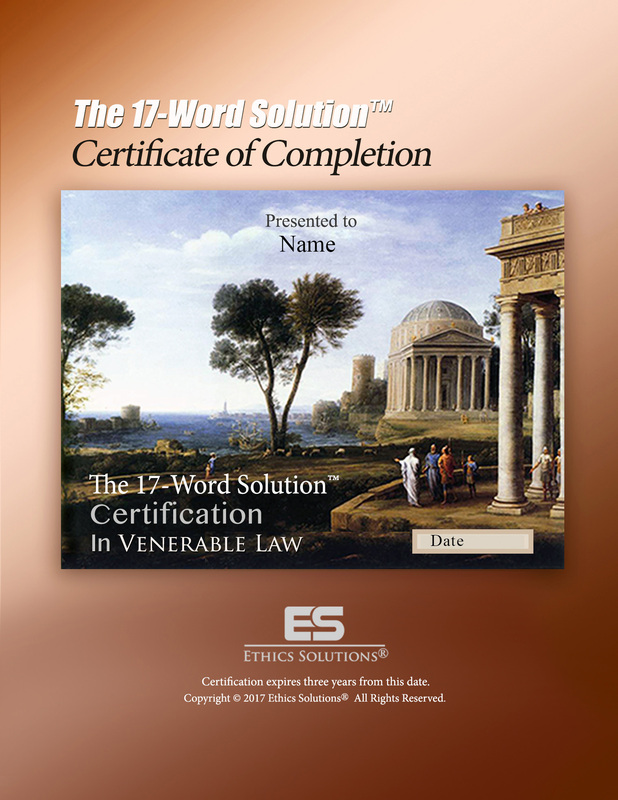 • Every 12 months after passing the assessment, you may add a year to the statement, "Certified by Ethics Solutions® for ___ years." • If you score 90% or more, you can use the statement "Certified Top Rated by Ethics Solutions®." • If every individual in your organization scores 70% or more, you can say the organization itself is certified. For instance, "ABC Builders is certified by Ethics Solutions®." Or, if everyone achieves 90% or better, "…Top Rated by Ethics Solutions®." This will certainly help give you an edge over your competition. • Under the same rules, families (two or more related persons) can be "certified by Ethics Solutions®" or "Certified Top Rated by Ethics Solutions®." • The management of your organization or family can use the Analytics to better understand the ethics of each individual. This is especially helpful in hiring. Let us emphasize, passing the course is impressive. It can help you gather more friends and influence. It means you have gone the extra mile to acquire solid evidence that you are dependable, trustworthy and special. Visa and MasterCard accepted. Prices subject to change without notice.